Taken along the Oregon coast. This is a composite combining a short exposure for the seagulls with a long exposure for the incoming tide. It took almost an hour for the seagulls to get comfortable enough to fly over me. After may tries, they finally got into the perfect formation for this photo! 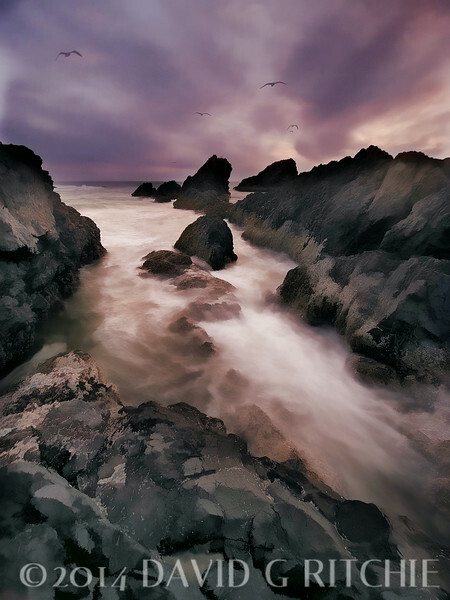 The photo was then modified to emphasize the dynamic interaction between seagulls and coastal landscapes. See also "Western U.S." section to view the original photo "Seagull Run #1", which gave rise to this interpretation.